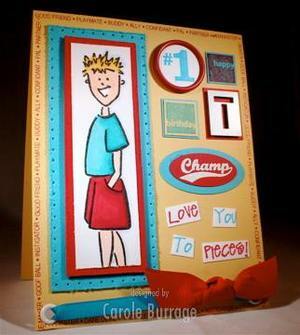 carole, saw the card (and commented on it) on scs, but what a heartwarming story behind it. i have an 11 year old son, also...i totally understand the "stringy burst of energy" part. thanks for sharing your wonderful works and wisdom! This card is absolutely adorable! So fun and bright! What a beautiful tribute to your Truman! You've got me all teary because I feel the same way about my son Aaron; he was a blue-eyed spiky blond boy with big beautiful teeth that he had to grow into but he's just the best kid, (or son I should say since I am blessed with an awesome daughter too)! He is 22 now and just graduated from college and landed a super job; Happy Birthday Truman and keep enjoying every ounce of him mom!!! I love the card you made for him!